Comments: Although the barn owl has excellent night vision, its ears may be even more important for catching food. Experiments have shown that prey can be located and captured by sound alone. Due to their nocturnal hunting habits many barn owls remain undetected even when living in close proximity to humans. Their favored roosts are high in the darkened ledges of old buildings. They also use holes in cliffs, quarry walls and hollow trees when available. Nesting barn owls will usually lay four to seven eggs, rarely as many as fourteen. Incubation begins with the first egg laid so hatching dates are staggered. A nest may contain young birds, nearly half grown, along with eggs ready to hatch. Distribution: As a species, the barn owl is the most cosmopolitan owl in the world. It is found on all continents except Antarctica. In Kansas, it occurs throughout the year. Most of the breeding records are from the western half of the state. 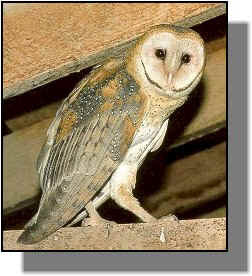 Food: Although primarily a rodent eater, the barn owl will occasionally take insects, snakes, lizards, frogs and crayfish. Birds are taken only rarely, usually sparrows or starlings.